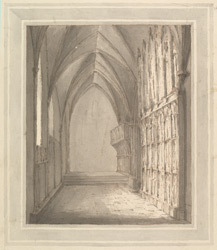 An east view, in bistre, in the north aisle of the choir of St. Alban's Abbey Church; drawn by John Carter. During the 13th century the Abbey was the most importantant Benedictine house in England and when the monastic community was at its largest there would have been 100 monks and 300 brethren in residence. The building has had many alterations since it was first built by Paul of Caen in the 11th century. In the 12th century the nave was altered by Abbot John of Cella, the south choir was rebuilt and the Lady Chapel was added in the 13th century and in the 19th century Lord Grimthorpe completely rebuilt the west front.